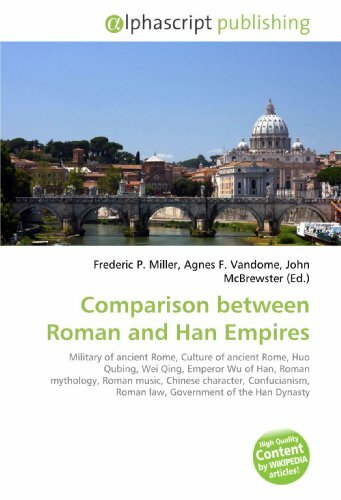 Jill Harries' work is a well written and economical portrait of the Late Roman legal system and the Law's central importance to the Late Antique notion of Empire.Itcomplements well the recent more technical works of Tony Honoré ("Law in the Crisis of Empire 379-455 AD : The Theodosian Dynasty and Its Quaestors") and John Matthews ("Laying Down the Law : A Study of the Theodosian Code"). 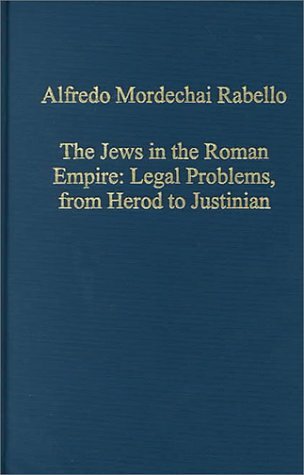 Although at times perhaps over-defensive about the use of violence in Late Antique Roman Law, Harries book generally provides an extremely well-balanced and lucid account of the theoretical and practical functioning of the Late Roman legal system.The book is accessible for beginners (whether interested in Late Antiquity, Roman Law, or, more generally in the functioning of "Law").In addition, Harries' monograph serves as a useful reference and jumping off point for in-depth study and debate by scholars. 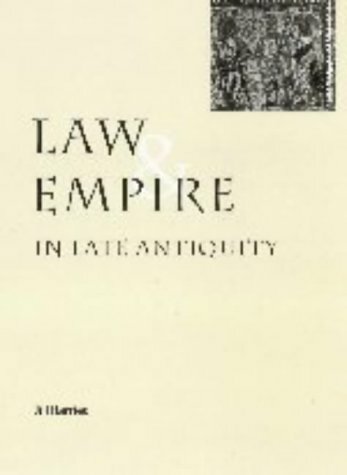 "Law and Empire in Late Antiquity" should be read by all with an interest in Late Antiquity or the history of law.Above all, it is an entertaining read, rich with detail, but with a eye toward presenting the topic with clarity and concision.In my opinion, Harries' book is the best introduction to the topic.I recommend it wholeheartedly. 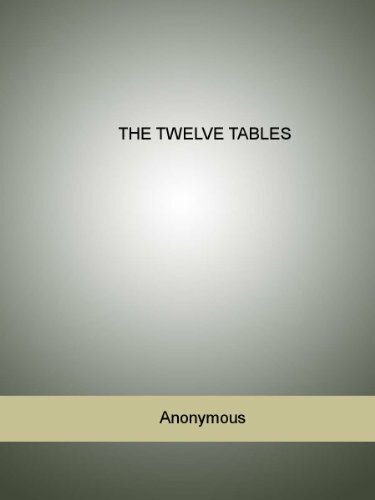 The legal history of Rome begins properly with the Twelve Tables. It is strictly the first and the only Roman code, collecting the earliest known laws of the Roman people and forming the foundation of the whole fabric of Roman Law. Its importance lies in the fact that by its promulgation was substituted for an unwritten usage, of which the knowledge had been confined to some citizens of the community, a public and written body of laws, which were easily accessible to and strictly binding on all citizens of Rome. 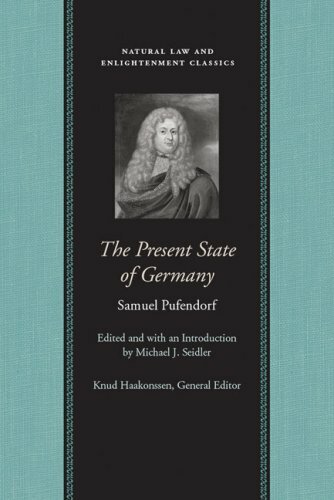 I've an older edition of this translation and I've enjoyed working my way through this work; one that shows the modern reader some of the ancient roots, the fairly consistent, and stable tradition of law in the Western World. Of course, as one reads this work and finds distasteful references to slaves (a major part of the laws of the time were devoted to the maintenance and governance of this horrible institution) and perceives too the much diminished rights of women in Romano-Byzantine society, one is also grateful that our legal system is one that has also changed and improved greatly over the centuries. Another observation one gains from this textbook for law students, which accompanied the new code issued by Justinian, is the continuity and direct development of precedent setting laws from earlier Roman times (the Twelve Tables, the laws and codes of past Roman emperors) to the reign of Justinian.The division between "Roman" and "Byzantine" is artificial, and the date for that artificial division differs in different disciplines. The Institutes show clearly that to the Romano-Byzantine peoples, the development of their laws was a development of their ancient, if changing, society rather than an example of any radical change or break at some point. One of the things I've done is to write down words that are unfamiliar to me as I read through portions of this work, and then look them up using the eighth edition of Black's Law Dictionary.Because I am not a lawyer many of these words are new to my vocabulary.I have generally found that 85% or more of the terms used by Justinian (at least as translated by Mr. Moyle) are still in use, or at least to be found in the modern edition of this law dictionary. 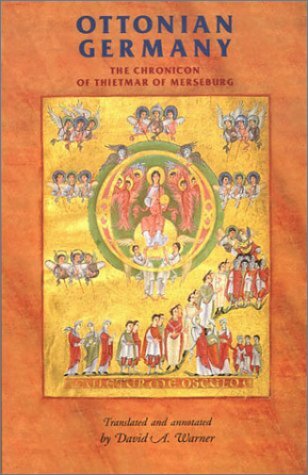 The Chronicon of Thietmar of Merseburg --translated here for the first time in its entirety--is one of the most important sources for the history of the 10th and early-11th centuries, and especially of the Ottoman Empire. Thietmar is arguably the most important witness to the early history of Poland, and his detailed descriptions of Slavic folklore are the earliest on record. He offers striking portraits of his contemporaries, revealing opinions from politics to women's fashion. 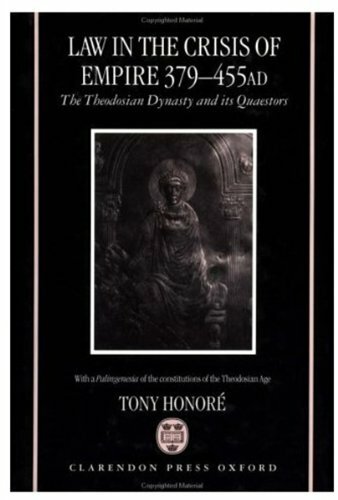 Ottonian Germany: The Chronicon of Thietmar of Mersebrg is more useful as a means of getting an insight into the culture, politics and mindset of the Holy Roman Empire of the 10th and 11th centuries than as any kind of actual history of the period. It helps to understand that it was written, not by a historian trying to make sense of the period but by a bishop who lived during the period and had connections to many of the key players of the day. It also helps to remember that a chronicon, or chronicle, is not a proper history but "a narrative historical account of events arranged in order of time usually without analysis or interpretation". And lastly, it helps to accept up front that Thietmar, though very much a man of his time, was in no way a professional writer and that reading his chronicon requires a certain dogged determination on the part of the reader. That said, I feel that Thietmar's Chronicon does have value if what you want is some insight into the culture, politics and mindset of the world Thietmar lived in. In the Chronicon, you get a sense of the constant three-way power struggle that characterized the Holy Roman Empire, a loose empire of individual principalities (each with its own duke, king, count, margrave and other titled nobility) with the Emperor at the top and with the church as the binding cultural force. Much of the chronicon deals with the never-ending conflicts between the Emperor and the nobility, between the nobility and the church, and between the church and the emporer. Thietmar's perspective, as a bishop and as a member of the nobility, gives a unique insight into the dynamics of these struggles, ones in which divided loyalties were a common problem. This was further complicated by the fact that there were no clear dividing lines between the three sides, since most of the higher clergy were members of the nobility and many of the nobility had familial ties to the Emperor. And on top of that, when the Emperor was not fighting with the nobility himself, he was having to try to keep the nobility from fighting each other (fueding nobles were a constant problem) and to keep the empire from falling victim to external threats as well. Poland (or what would later be Poland) was a particular thorn in the empire's side. "At that time, a cleric of noble lineage, named Dietrich, lived in our vicinity.On the recommendation of the aforementioned count, he acquired the provostship in return for ten manses. After he had occupied it for more than ten years, my mother died. As the third son, I then inherited the abbey and received half of its property from my brothers. Thereafter, I frequently asked my uncle to let me assume the provostship and do so as a gift or at least for a modest price. After long and difficult negotiations, he asked me for a large payment, ignoring the obligations of both love and affinity. In the absence of support from my brothers, I agreed to his demand and was made protector of this church of which I was already a servant through my paternal inheritance on 7 May of the year 1002. The cooperation of my predecessor was obtained in return for acceptable compensation." "In the following year, at the rooster's first crow, a light as bright as day shone from the north and remained for one hour but vanished as the rest of the sky grew red. Some people claim that, in the same year, they saw three suns, three moons, and the stars doing battle with one another. After this, Archbishop Ekbert of Trier died and was succeeded by Liudolf; likewise Dodo of Munster after whom Swidger was consecrated; and Erp of Verden who was succeeded by the provest of the cathedral, Bernhar. A great famine also oppressed our regions." "Meanwhile, in a certain village called Hordorf, an infant was born who was only half human; from behind he was similar to a goose, his right ear and eye were smaller than the left, his teeth were yellow as saffron; he lacked four fingers on his left hand with only the thumb being normal; before his baptism he had a rather dazed expression but afterwards nothing at all. He died on the fourth day. Becuase of our misdeeds, this monster brought a great pestilence." This also illustrates one of the more frustrating aspects of the book. Thietmar will often go on for pages about events surrounding the death or succession of various members of the clergy, and then throw in as an afterthought one-line asides akin to "And there was a famine" (or war, flood or plague) and then go on with no further description or comment on the matter. 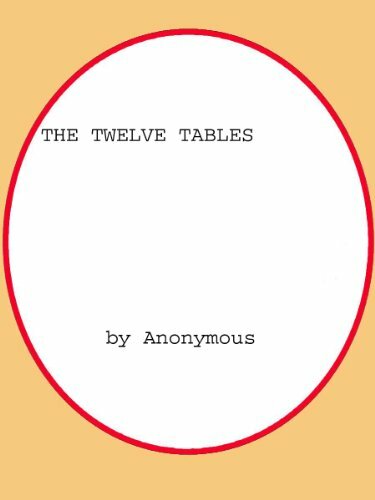 There are more interesting anecdotes mixed in, such as when Thietmar's uncles are captured by pirates and held for ransom and when some particularly unpleasant noble gets his comeuppance. And some of the descriptions of battles are quite vivid as well. All that said, if you can get through Thietmar's meandering, haphazard and anecdotal style, you do come away with a definite feel for the period with its endless conflicts and shifting loyalties, and its overwhelming religiousity combined with deep superstition and hard-nosed politicking. The book does have definite value in that context, but you really have to work to get it. With that mind, I would recommend it to serious students of the period. Thietmar was a bishop of Merseburg which is in what is now Germany. 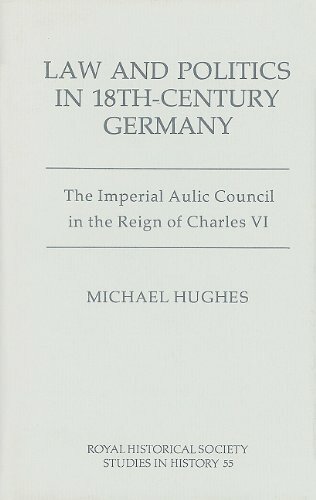 His chronicle covers the reigns of Henry I, Otto I, II & III, and Henry II. This is a valuable source finally available in English. Because I am new to this timeperiod in medieval history, the extensive background material provided by the translater David A. Warner was a big bonus. Also included are extensive footnotes, geneologies, maps, an index and a bibliograhy. I rate this a 'must have' source for those with an interest in the period.